Despite it still being December, the Christmas theme has been temporarily paused to deal with lots of songs to do with telephones. 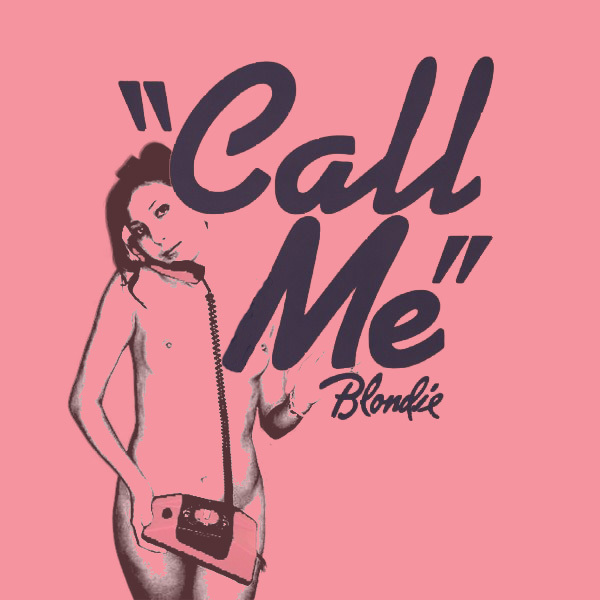 This 1980 song from New York new wave popsters Blondie is called Call Me. Not 'maybe' but definitely. The cover sees Debbie Harry (later called Deborah Harold for some reason) sitting on the floor in what can only be presumed to be a black leather jacket. There is a key element missing from this cover, and that is any sign of a telephone. 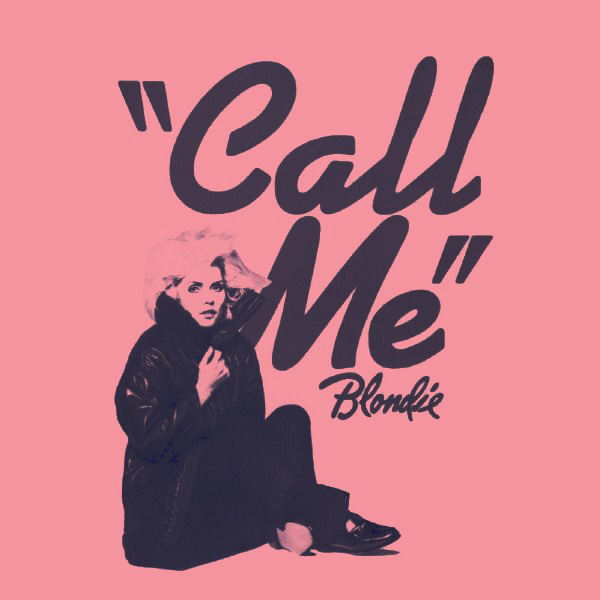 How can a song be called 'Call Me' without a telephone or some other type of communication apparatus being visible with which to make the call? The mind boggles at the lack of imagination of those responsible for preparing the singles cover artwork of the 1980s. Click to view the full-size image [600px by 600px]. The revised version does not, in case you were wondering, feature a photograph of the previously mentioned Ms Harry/Harold/Whatever. Instead a young lady is pictured but very very importantly for a song called Call Me, she is holding a telephone. For some reason, all of her clothes seem to have fallen off and it it was not for the rather large 1980s telephone that she is holding in her hand, we would know far too much about the shaving habits of this poor girl. Actually, there is no reason to suppose that she is poor, and indeed anyone who had a telephone in the 1980s and could afford to hold lengthy conversations whilst naked, was perhaps better off than her lack of available clothes would lead you to presuppose. As it's December, the Holiday theme is continuing right on with another of those songs that only comes out at this time of year. 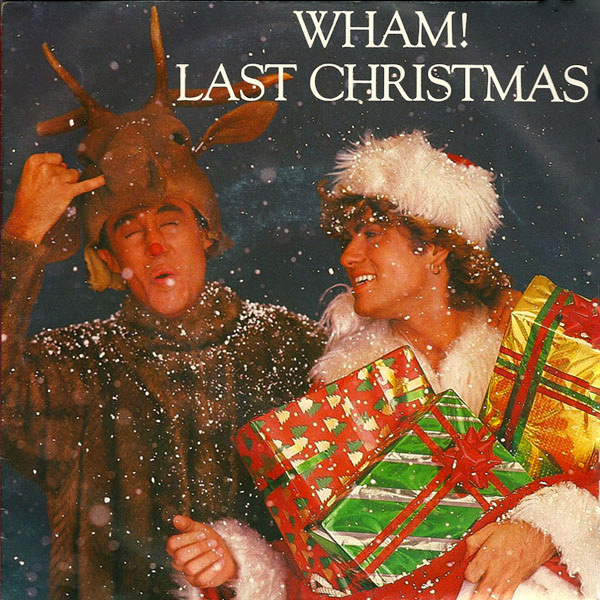 Last Christmas by British group Wham! sees George Michael and his buddy rueing the fact that last year they gave their hearts to someone or other, but the next day those self-same hearts were given away. Presumably to charity. Anyhow, this year, to save them from tears, they are going to give them to someone special. Presumably last year's recipient was not special which was what caused the problem in the first place. The cover sees the Wham! duo dressed in festive outfits (one as a reindeer and the other in the usual Santa lookalike kit) holding presents in the snow. How Christmassy. Click to open the full-size image [600px by 600px]. What we see in the updated version are the recipients of last year's hearts. It is reasonably clear to see why the Wham! boys were attracted to these two ladies and what might therefore have caused them to give their hearts away. It is also not too difficult to see that they are also not particularly special, and have the kind of smile which just screams, "Don't give me your heart, you idiot, because I will take it to the charity outlet as soon as the sun rises." You can tell they're not that special as their Holiday outfits are green and not red, which is both erroneous (only elves where green, humans should wear red) and would have jarred badly with the boys' outfits. To be brutal, Annie Lennox the lead singer of the Eurythmics, has always had a face that would cause nightmares more than it would 'Sweet Dreams'; her scary, androgynous looks being more akin to salt and vinegar chips than smooth silky chocolate. 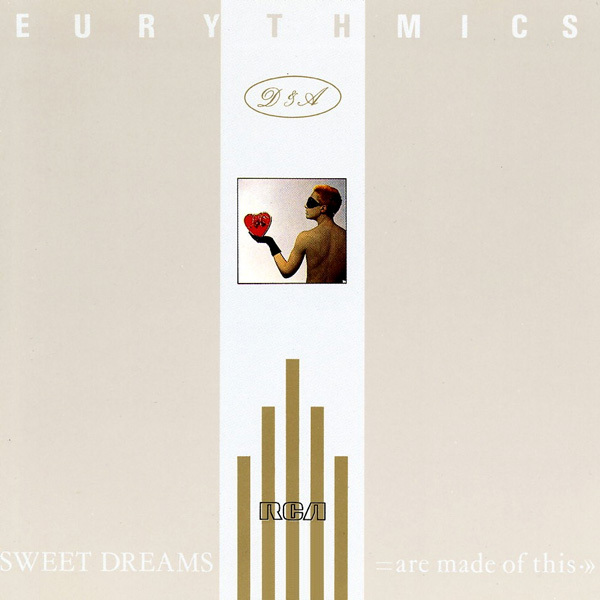 There are, of course, those who like salt and vinegar chips and in the words of Ms Lennox herself in this 1983 single, ‘Who am I do disagree?’ But the picture of Ms Lennox on cover, no matter how small, does not elicit dreams of the sugary kind. Notwithstanding Ms Lennox’s acerbic charm, Mr Dave Stewart her partner in the band who is not, thankfully, shown on the cover, would add little by the way of counterbalancing flavour, being similar in visage to an unfashionable porcupine. 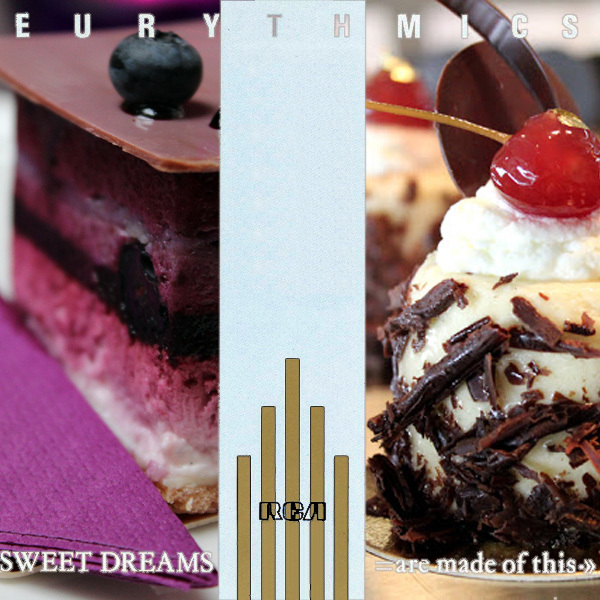 The revised cover is definitely something that ‘sweet dreams are made of’. Sugar and spice and all things nice. Almost. But surely even the biggest sucrophobe¹ would have to admit that the selection of desserts is highly tempting. In the song Ms Lennox points out that ‘Everybody is Looking for Something’. The meaning of this is now much more apparent. Whilst some may seek one particular type of sucrolytic² satisfaction through, for example, the medium of cake, others may find similar satisfaction in buns or tarts. Paradoxically, tarts seem to be more favoured by men who like to try many different kinds until they find one they like, whereas buns are more often preferred by females who will often test to see how firm they are before deciding which one to take. ¹ A ‘sucrophobe’ is someone who dislikes sugary things. ‘Sucro’ is taken from ‘sucrose’ meaning sugar, and ‘phobe’ is short for ‘phobia’ meaning ‘an irrational fear or aversion to something’. ² ‘Sucrolytic’ means ‘causing pleasurable collapse through sucrorial³ intake’. ‘Sucro’ is taken from ‘sucrose’ meaning sugar, and ‘lytic’ means ‘something that causes one to break down or become loose. ³ ‘Sucrorial’ means ‘relating to or connected with sucrose (sugar)’. It is great to receive submissions from people who are getting the hang of what AllBum.Art is all about. This one is from two ladies who call themselves 'Ms Holly Da Yin' and 'Ms Mary Ott'. 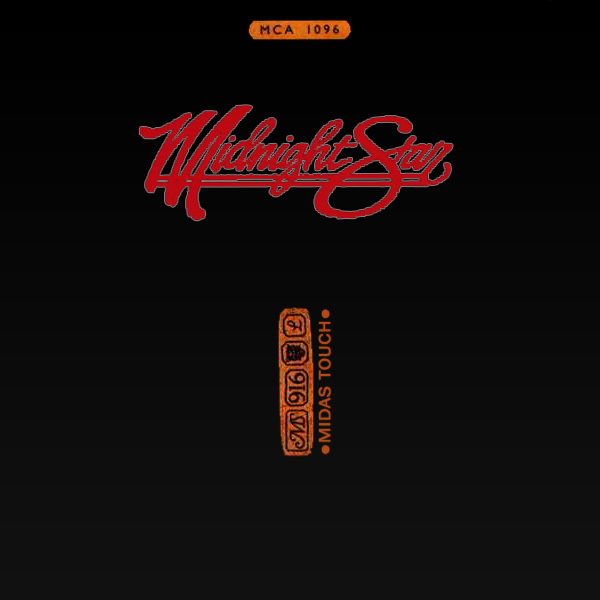 They were rather bored by the cover for the 1986 cover of the single 'Midas Touch' by Midnight Star. The black cover with red lettering and the addition of a tiny amount of gold, did not seem, to them, to reflect the notion that 'everything' that was touched 'turned to gold'. Surely, in such a situation, the single cover itself would be completely gold (and anyone who bought it would now be very rich, given the rise in gold prices in recent years). Ms Da Yin and Ms Ott instead fused the original cover with that of a picture of Ms Paris Hilton (a made-up name if ever there was one) who had been turned to gold. All her surroundings have also turned to gold, though it seems that the gold is still in a liquid state meaning that the temperature would have had to have been over 1,000°C. Although some regard Ms Hilton as 'hot', at this kind of temperature, surely even she would have been burned to a frazzle. Regardless of this strange contradiction, Ms Da Yin and Ms Ott are to be congratulated on their fine contribution and awarded a gold star for their efforts. 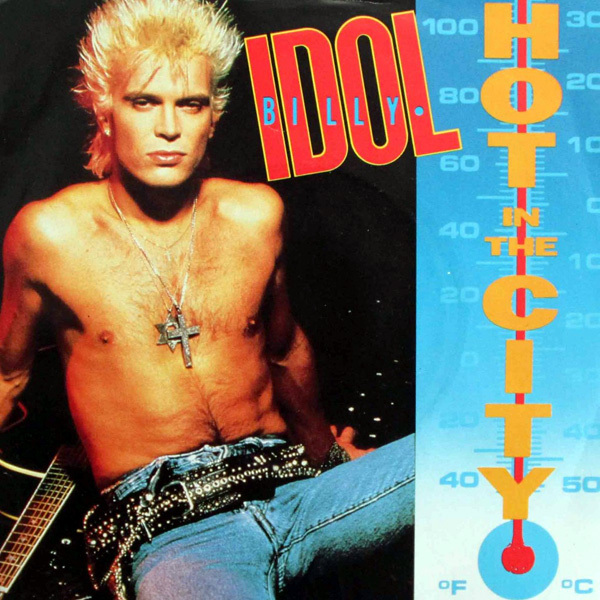 It is time to return once again to Mr Billy Idol, this time to his 1982 song 'White Wedding' again courtesy of Brent Gdzinski of Charleston, SC. There is some controversy over the meaning of the song but general agreement that being 'a nice day for a White Wedding' is less to do with the weather, and more that the idea of white weddings is connected with lace and frills and heightened emotional awareness and thus, what Mr Idol is really saying is that it is 'a nice day to go hunting for women'. 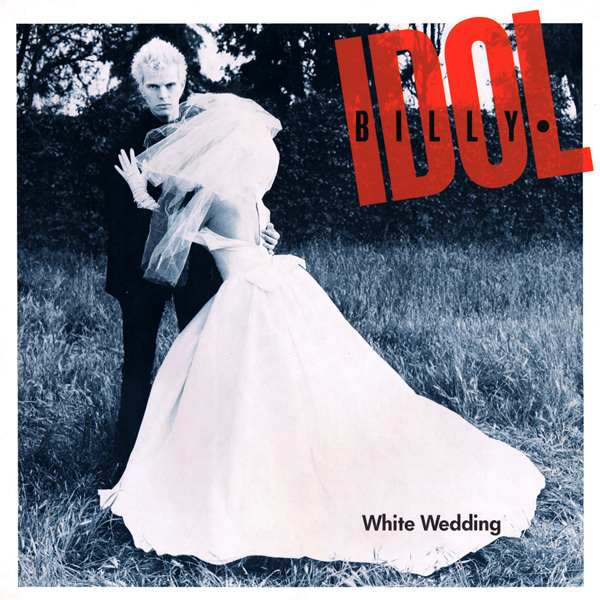 In the cover of the single, if you look carefully, you will notice that the wedding dress that the girl is wearing has been undone, presumably by Mr Idol, and that it is beginning to fall off. Having argued with Mr Idol about his manhandling of her dress, she has wandered off. Unfortunately, instead of heading back to the wedding breakfast, she has ended up deeper in the forest. Without a pin to repair her dress, it has fallen down, having been caught on a sharp twig. It is to be hoped that Mr Idol shows some repentance and heads off into the forest to help out the maiden whose wedding day he has no doubt ruined.